I love Romero's approach (how could anyone not?) to liberation. 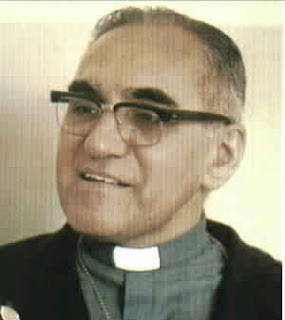 For Romero, Christ's liberating force does indeed exist "in the world," it is indeed a liberation that happens within history positioning liberating movements as being in true participation with the work of God in the world. God is really and actually working out salvation within history... not just afterward. Romero once said, "With Christ, God has injected himself into history. With the birth of Christ, God's reign is now inaugurated in human time" (The Violence of Love, page 25). God's reign does not tolerate "that an image of God be trampled by persons that become brutalized by trampling on others" (page 6). And since that reign, in Christ, is here and now the work of liberation is nothing less than the implementation of God's eternal reign. But, we cannot place our trust in liberation movements which are not centered upon Christ himself, although we may find ways to support and participate in them. For Romero, justice does not trump Christ but Christ transcends justice. "...All the liberating force in the world comes from Christ." Christ, the particular man from Nazareth and the God revealed in him, is the heart of all the action of the Church. For Christ, not mere justice, is where history is headed.